If you would like to read the first part in this article series please go to Installing and configuring Citrix StoreFront 3.5 (Part 1). 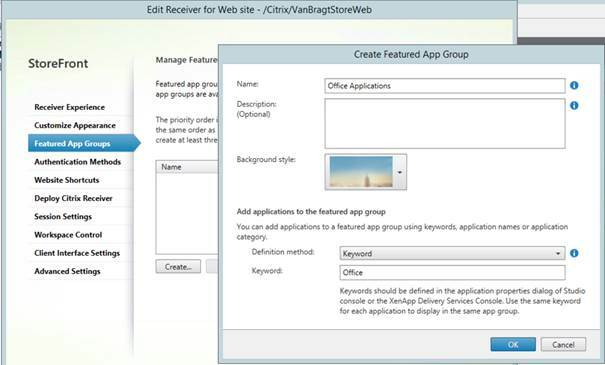 Citrix StoreFront is the successor of old good Citrix Web Interface. 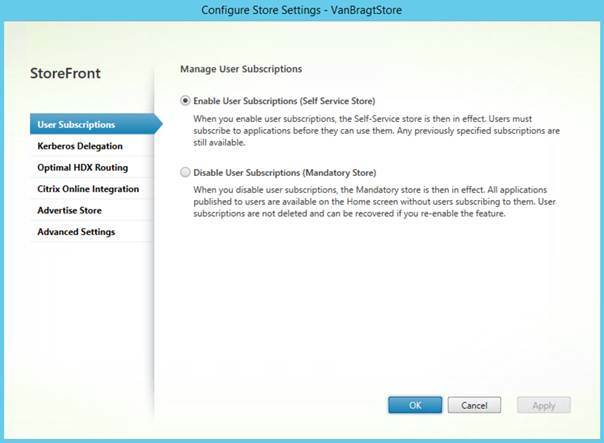 In this article series I’m discussing the installation and configuration of StoreFront 3.5. In part 1 we went through the installation steps, the initial configuration wizard and started with describing the configuration availabilities. We ended in part 1 at the Manage Authentication Methods, so we will continue with Manage Receiver for Web Sites. Within this component you can add, delete or configure the Receiver for Web Sites. 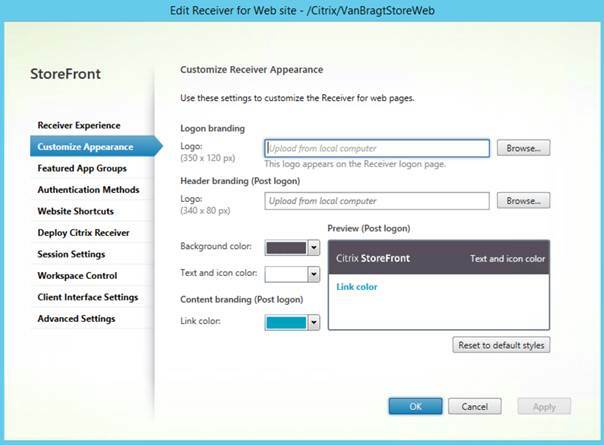 Per Store you can have more Receiver for Web Sites. This can be necessary if you need a different look and feel or different settings are required. Adding a Receiver for Web Site asks for a path (which the users’ needs to enter to access the web site), the look and feel and the authentication methods. When the Receiver for Web site is already available you can edit the configuration. There are a lot of options available as shown in figure 1. First of all you can enable or disable the Unified Experience on this level. This makes it possible to configure two Receiver for Web sites, where you can both offer the old and new look and feel in a migration project for example. At Customize Appearance you can change the look and feel/branding. Within the GUI you can change logo and header and some basic colors. There are many more options via other methods. I will go into more detail about this topic in a separate article. Another option is the Featured App Groups. Via this option you can group Published Applications in the Receiver for Web sites. This can be useful if users have a lot of Published Applications to find applications more quickly. The applications can be grouped based on keywords, which can be defined as one of the properties. The Featured Groups are shown in blocks above the overview of Published Applications. At authentication methods you can enable or disable the authentication method on the Receiver for Web sites, while at Website shortcuts you can integrate the StoreFront functionality within your business website. Till now I did not use this option, so unfortunately I cannot share any experiences of this feature. 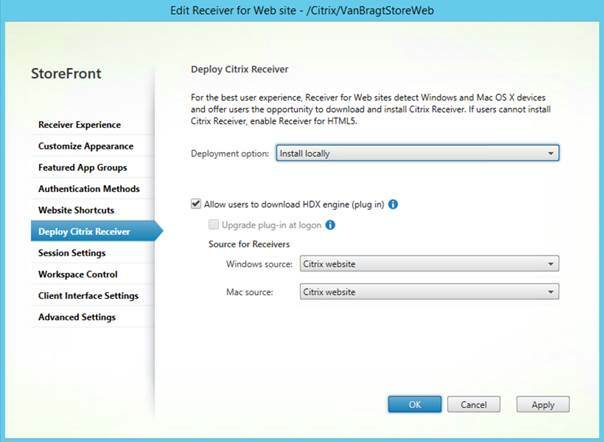 At Deploy Citrix Receiver you can select the deployment options of the Citrix Receiver. By default, Install locally is selected, but this can be changed to Always use Receiver for HTML5 or Use Receiver for HTML 5 if the local Receiver is unavailable. When you select an option where the local Receiver is included you can also offer a download of the local Citrix Receiver. The client can be offered via the website of Citrix, local on the StoreFront server or on a remote server. When using the StoreFront Server you can also upload the client to the correct location. Also when you offer the client via the StoreFront server the plug-in can be upgraded when the users log in. The next configuration option is labeled Session Settings. 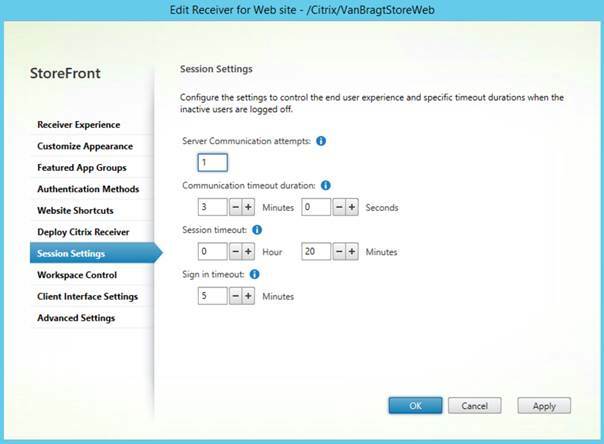 Here you can define several session time-outs for the StoreFront environment. The most important is the session time-out. With this setting you define when the Receiver for Web site logs off the user of the website. There is no correct setting for this one, it depends on the customer needs. For example an organization starting a desktop will use a shorter session time out than an organization that is using Published Applications. 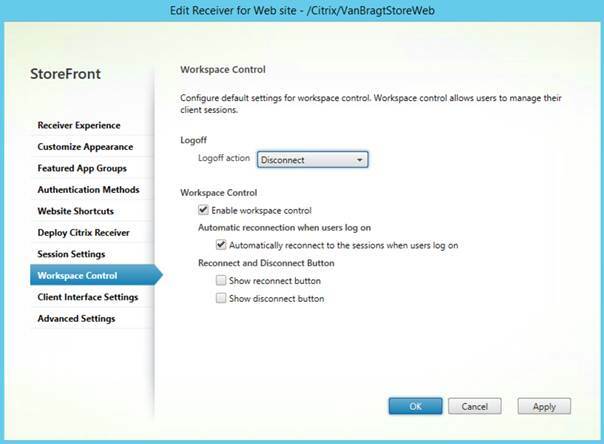 Workspace Control is the feature that Citrix has already been promoting for years. Even at the last Citrix Synergy the roaming of sessions was used in one of the demos. That roaming of session is based on Workspace Control. On the tab Workspace Control you can enable or disable the roaming behavior and if enabled how Workspace Control should be responding including the option to show the option in the GUI of the Receiver for Web sites. Another important tab is Client Interface Settings. On this tab you can configure the behavior of the Receiver for Web sites. You can enable or disable the auto start of a XenApp/XenDesktop desktop when using a desktop. You can also enable or disable the Desktop Viewer (the black toolbar showing on top of the Citrix session). Also the time between multiple clicks can be configured on this tab (so users do not start a Published Application or Desktop multiple times). Also the view of StoreFront can be defined: showing or not showing the desktop or application view or both. The default view can also be configured. This comes into play if you both have a desktop(s) and applications published and want to set a view as default. Be careful with auto as this is dependent of the Receiver experience configured. The last tab is as the name applies for Advanced Settings. The most important one is probably enabling or disabling the folder view, this one was requested a lot. The other options I would not change from default. On this part you can configure the connection with the NetScaler Gateway for remote access. The options are the same as shown during the initial wizard. Just as Configure Remote Access Settings this part is also available in the initial wizard. Here you can change configure or change the functionality formerly known as PNAgent. The options are exactly the same as during the initial wizard. 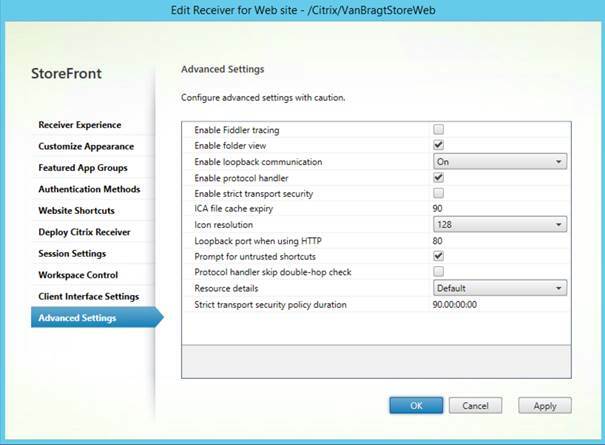 Within Configure Store Settings, options can be found that are applied at the Store level. Several options are available. The first option is User Subscription. Within this option you can enable the User Subscription feature, which makes it possible for users to favorite their Desktops or Published Applications shown on the home screen of StoreFront. Second option is Kerberos Delegation. Here you can enable or disable Kerberos delegation to the Delivery Controllers. I never used the Kerberos delegation part, so I cannot share experiences with this functionality. New in StoreFront 3.5 is Optimal HDX Routing. Optimal HDX Routing works in combination with the Zones functionality introduced in XenDesktop 7.7. 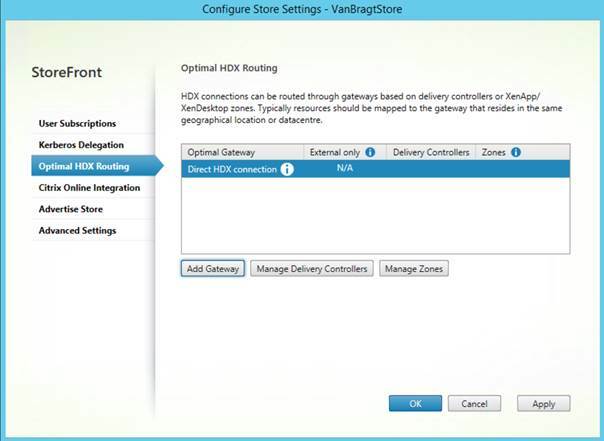 With Optimal HDX Routing Users can be routed to the NetScaler Gateway that is located in the same datacenter as the XenDesktop/XenApp server or VDI where the user is routed to. For each NetScaler Gateway you can specify the zone name(s) for which the Gateway is the primary access point. Next is the Citrix Online Integration. Here you can enable that icons are shown to the end-user of the Citrix Online products GoToMeeting, GoToWebinar and GoToTraining. Happily those icons are disabled by default, in previous versions they were enabled by default. Within Advertise Store you can configure that the store is presented to the end user when using e-mail discovery, while the last option Advanced Settings is offering all kinds of settings that do not fit in the just discussed components. Within Advanced Settings some interesting options are available like Allow Font Smoothing, allow session reconnect, Enable socket spooling, Filter resources and override ICA client name. I advise only to change those settings, when support articles are pointing to changing those settings for issues you currently have. This is actually not a configuration option, but the option to generate a file that can be used to configure the Receiver to communicate with the Citrix infrastructure. The Manage NetScaler Gateways and Manage Beacons options are placed higher in the pane as those are not limited to one Store. Within Manage NetScaler Gateways you can add, delete or modify the NetScaler Gateway settings together with the Secure Ticket Authority options. The options are similar as shown in the initial configuration wizard and are also available at Configure Remote Access settings. Manage Beacons is a separate component. Within Beacons you add sites so StoreFront can determine if the connection is made from the internal network or is set-up from the Internet. This is required when using the same URL for internal as external sessions. We went through all the configuration options available in StoreFront 3.5. As a last topic I will show you how to create a fault tolerant/load balanced StoreFront infrastructure. Till now we have worked with one StoreFront server. Citrix did a good job about publishing a document about the scalability of Citrix StoreFront. In one of the articles they mention that a 2 vCPU StoreFront server can handle 32000 user connections per hour and with more CPU’s added this number can go up to 75000 user connections per hour. For many organizations those numbers are high enough to use one server for handling the load. However for fault tolerance you want to have at least one additional server. In StoreFront servers can be easily combined to a so called Server Group. Let’s take a look how to set-up a Server Group. The first step is to install a StoreFront server and configure those to your need (at least the initial configuration wizard). The second step is to install another StoreFront server via the installation steps shown in part 1. When the installation is complete go to the StoreFront Console on the first server and choose Server Group in the left pane. Within the Server Group in the right pane there is the option Add Server. When using Add Server a window will pop-up showing the information to add a server to this server (group). On the server you would like to add you choose Join existing Server Group in the StoreFront console. After that you need to fill in the provided information from the first server. Next the servers will be connected and the configuration is replicated to the new server. When the process is finished on both machines a message will be displayed about the join process. Do not forget that the servers are not replicating automatically. When you make changes to the configuration you always execute the task on the first server, when the changes are done you go to the server group part and choose Replicate changes from the right pane. 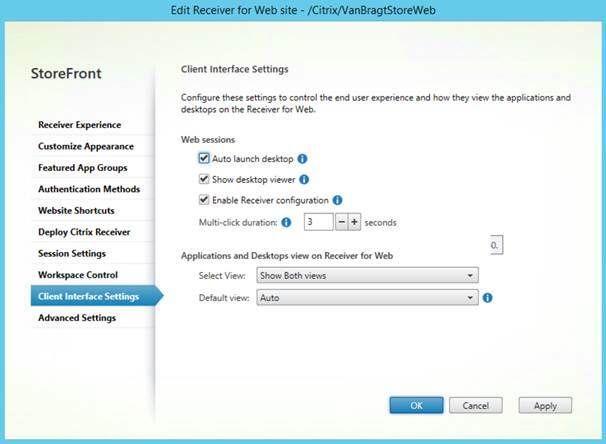 Now the configuration of StoreFront is replicated and available on both StoreFront servers. However StoreFront does not provide an option out of the product to load balance the users over the two servers automatically. For that we need to add a (hardware) load balancer. You can use a NetScaler appliance for example. In an earlier article I already explained those steps. 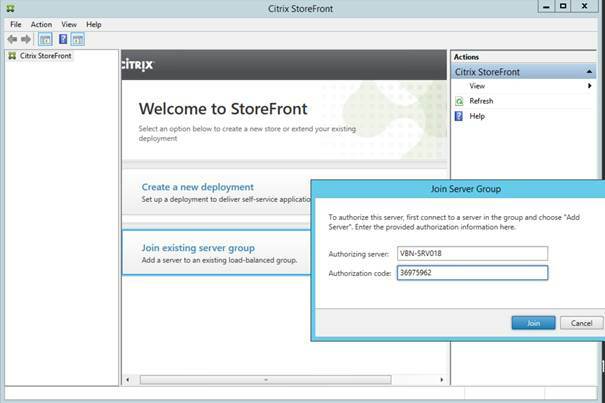 In this article series I described the steps to install and configure a Citrix StoreFront 3.5 server. In part 1 we executed the installation, the initial configuration wizard and started with the configuration options. In this second and last part we continued with the configuration options and set-up a StoreFront Server Group for load balancing and fault tolerance. If i have different session timeouts on two Storefront servers which is part of the same server group (For example, Session timeout = 1 hr on one and 24 hrs on the other) which setting will be used ? Is it possible that if a user has contacted Storefront Server1, the session timeout on Server 1 will be used and if the user has contacted Server 2, the session timeout of Server 2 will be used ? When using a server group you need to change the settings on the first server and propogate the changes to the other server(s) to keep the user experience consistent. However the configuration is indeed local on each server. So if there are configuration differences, the behavior will be different as wel. In your example the setting on server 1 will be used for session on this server and vice versa.